So, this one time, in order to make things to sell at Wizard World Madison – my profile on the Wizard World site – I decided that I should do a massive amount of screen printing in one day and I deemed that day “Tea Towelpalooza,” the results of this lunacy are displayed below. I will be bringing all the successful prints I finished that day to Wizard World Madison on April 8-9-10, and as I am a big fan of unusual kitchen things (especially novelty tea towels, ever since I didn’t buy a Nick Cave tea towel the first time I ever saw one at a show in Manchester in 2005 – Never again will I refrain from buying a Nick Cave tea towel! No more regrets! 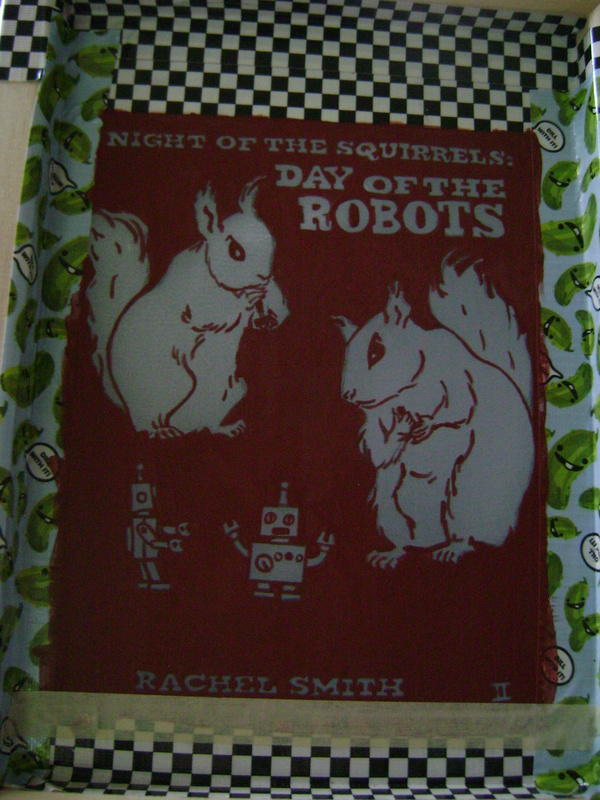 ), thirtyish of those successful prints are on tea towels. This is the end of having available space in my living room until the prints dried. That’s right, it’s Parks and Rec fan art tea towels. I do love a skull or a mini-horse, and this design I created has both; so, Bye bye, Li’l Sebastian, you’re 5000 candles in the wind and this is my tribute. I hand painted in the red side of every pair of 3-D glasses. It was meticulous. I will never do it again. David Tennant is a major super awesome guest at Wizard World Madison, so I hope he enjoys my guinea pig parody of his turn as Doctor Who. And here’s Danger Crumples in red and blue as Matt Smith’s 11th Doctor. Putting a fez on Danger was impossible to resist. He also has a bow tie. The dissolving of the Danger Whos. I will only print these images once – some of them went badly and I had to re-paint my screen filler and print them again, but, there’s still a serious level of singularity in that these hand pulled prints and tea towels are going to be available at Wizard World Madison first and it may be the only time my hand pulled, hand packaged versions of them will be available. 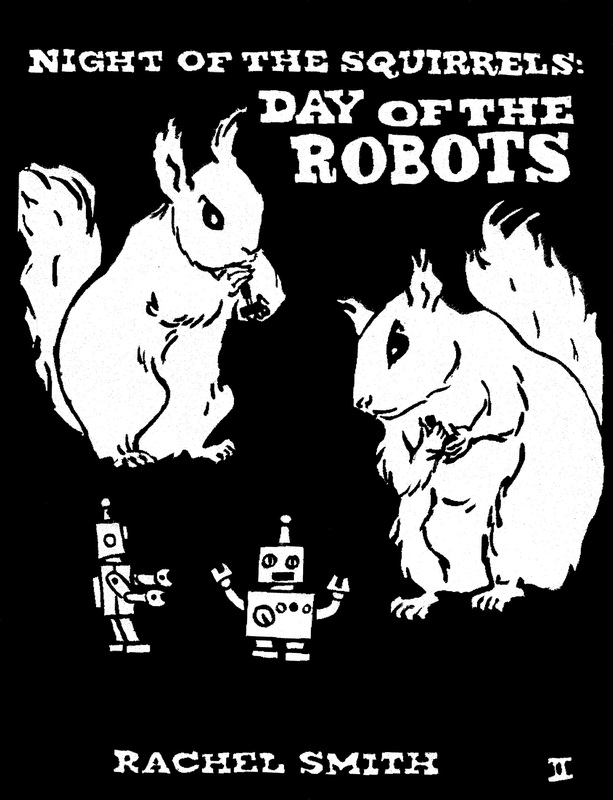 Also, I know it’s weird to see my human kitchen. I’m a person who displays a still packaged coffee cup for squirrels. I’m not going to open it and make them coffee, I barely know how to make coffee. So, the last post I made mere seconds ago made me super sad. And then, I noticed that someone found my blog by searching for “adjectives for guinea pigs” and my mood changed slightly – cute didn’t instantaneously come to mind, searcher? Yeah, I’d say that’s pretty cute. Belvedere knows how to sit. The other adjective that comes to mind (beyond like fifty synonyms for “cute”) when I think of guinea pigs is: Demanding. Yes, demanding is so much more than an adjective. I think it’s obvious that Mortemer wants something here. 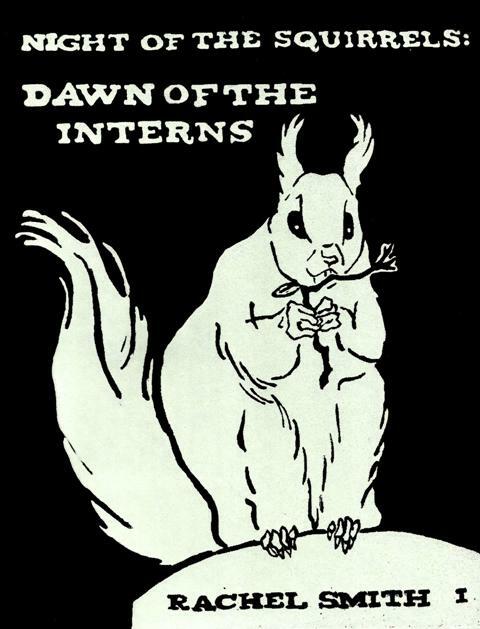 Also, I wanted to mention that this week I screenprinted the new cover for Dawn of the Interns and I am super happy with it. I am quite fond of my Pickles model guinea pig cover , but it seems relevant to make a slightly more appropriate cover, since I have the skills. I would say I have the technology, but I’m a hand done art kind of person. My silkscreens are hand drawn, hand stenciled (no photo emulsion, it goes bad and might get on the carpet), and hand pulled – which often leads to tragedy. 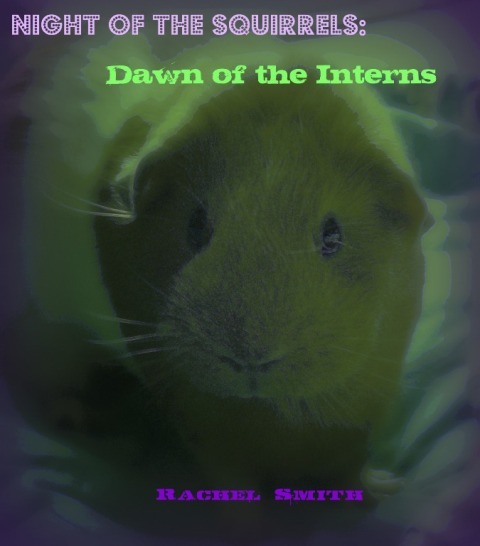 Twiglet, subject of the sadness inducing post and anchor pig forever in my heart, will of course be on the guinea pig version cover of the last book in the Night of the Squirrels trilogy. I haven’t written that one yet, but the new cover and the second volume in the trilogy, also with a guinea pig cover (featuring the beautiful Duncan) will be out in May. “Snazzy” also comes to mind. Check out the Abyssinian moustache on Thaddeus. One could also use the adjectives: smart, fluffy, fuzzy, portly, or perfect to describe any number of guinea pigs.